Some 6 months ago I was given the privilege to cast delete votes on posts. I very rarely use my votes because in most cases I'm really not sure if a post deserves to be deleted, and I find it difficult to find information that clears this up. 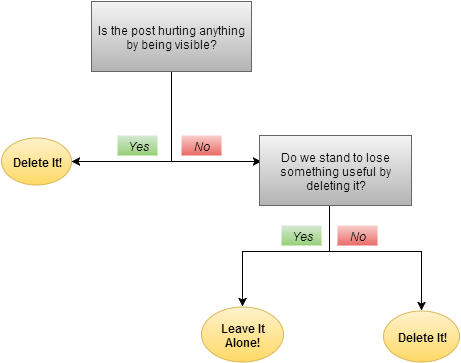 This morning we had somewhat of a discussion in the SOCVR chat room regarding off-topic or otherwise 'bad' questions that was triggered by a request to delete this off-topic question. While there may be no doubt that it is off-topic, I was hesitant to vote to delete it because it has ~75k views, a score of +32 and some answers that at the very least contain some useful bits of information for future visitors. It didn't matter though, because it was quickly deleted by others who all agreed that it's off-topic and off-topic questions should be deleted. I figured the opinion of the 'crowd' outweighs my own and went to look for other such posts that, by this consensus, deserve to be deleted. Not necessarily to take action, more to see what's out there. (they have these for just about every language, all off-topic, all closed, some locked, some deleted I guess, like that Swift IDE one). What's the best mock framework for Java? If we were to be consistent, it would make sense to undelete the Swift IDE question, because it's barely different from the ones listed above. I found most of these questions are locked instead of deleted (results are biased in favor of my case because I cannot search for deleted posts). But why? When is a question significant enough to keep it around instead of getting rid of it? Which is really vague. When does a question have lasting value? It is based on community consensus. There is no general case rule; they are discussed on a case by case basis to determine if the community feels that the post is adding sufficient value to warrant keeping it around or not. Ideally, off-topic closures (as well as most non-dupe closures) should get deleted. The reason they're not immediately deleted is because sometimes they can be fixed to no longer be off-topic. Closing's purpose includes given the author, or other users, the opportunity to fix an unacceptable question and consequently get it reopened. That's why they stick around. How long they stick around is dependent on who is running around performing the necessary deletions. Who is "running around performing necessary deletions"? Mods, but also us.. the community. I am part of this community but I cannot perform necessary deletions if I don't know when deletion is necessary. This post is by no means intended to offend anyone in any way. I only seek clarification. I understand this may be a complex issue and maybe there isn't one rule to delete them all (or not), but thoughts and ideas are welcome. Always vote to delete closed questions unless their existence is making the Internet a better place. The only tricky thing about that rule is defining what it means to "make the Internet a better place." Well, obviously anything that is spam, noise, or otherwise worthless is making the Internet a worse place, so these cannot be an exception to the deletion rule. The community consensus is strong here; everyone knows crap when they see it. The tricky part is what should save a question from deletion (which, as Grace Note and Shog9 have pointed out, is a closed question's destiny). I choose to save questions whose answers contain useful information that cannot trivially be found elsewhere and might be useful to others in the future. I do not see any merit in rushing to delete borderline cases. Bonus chatter: there was a big hullaballoo several years ago on the Meta site, effectively dividing the community into two groups: the "deletionists" and "preservationists." Like all labels, these were not entirely apt, but they captured the essence of the positions in the debate. One group felt that questions that were once acceptable, but now fell afoul of our new guidelines, should be deleted because their presence was hurting the site—they were effectively serving as "broken windows," suggesting to new users that these types of questions were on-topic and acceptable when they really weren't. The second group wasn't quite sure that they agreed with that logic, but even to the extent that they did, they screamed about the need to exercise caution over the risk of deleting potentially useful and interesting content, arguing that those old, historical questions made meaningful contributions to the body of knowledge on the Internet, making it a better place, even though our guidelines had since evolved and we were no longer willing to take a gamble on that type of question going forward. The debate finally calmed down following the introduction of the "historical lock" feature, and now it seems to have been mostly forgotten. If you're curious and weren't there (what is wrong with you? ), the only link I can easily dig up is this one. I'm mostly in the camp that you shouldn't fear deletion, you should fear the loss of useful content. A deleted question whose useful content is available elsewhere is good deletion. Remember, not every question under the sun should be asked here, if that means that we need to expend more effort in making the content available in a more substantial form (i.e., too broad questions broken down, opinion-based becomes fact check, off-topic becomes blog post or examples on documentation, etc.) which are more searchable and precise. I personally hate it when off-topic but useful content gets deleted. Closure if for off-topic, deletion is for useless, unsalvageable stuff. 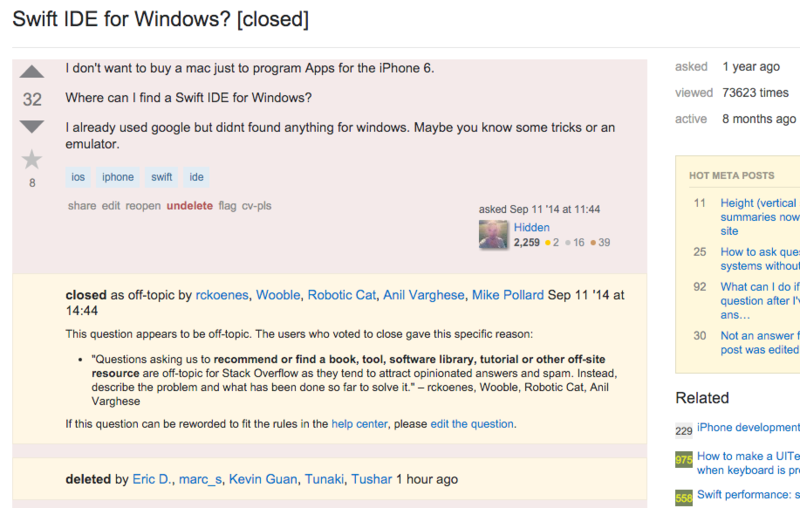 In this particular case, the user is not so much asking "to recommend or find a book, tool, software library, tutorial or other off-site resource" - the real question is: Can I create a SWIFT program on Windows? That is reasonably scoped and, if worded that way, probably on topic. So it is not even completely and obviously off-topic. Deletion seems very abusive in this case. I have edited the post and voted to undelete. With new knowledge, should I refine my question to make it more specific? How to flag a question so that it can't be deleted? What questions should be deleted? Should low quality novice questions be deleted? Are questions about usability and user interface on topic? Did we really have to delete good content again? Should I mod flag users who repeatedly answer a question and then vote to close it?